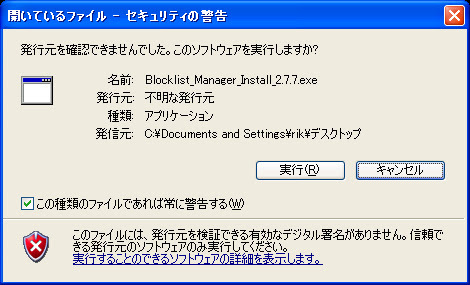 0day.jp (ゼロデイ.JP): [False Positive] Investigating Security Tool: Blocklist Manager 2.7.7 Addon "Angry IP Scanner"
[False Positive] Investigating Security Tool: Blocklist Manager 2.7.7 Addon "Angry IP Scanner"
The Blocklist Manager (BLM) is an all-in-one network security tool, allowing you to download a number of regularly updated IP blocklists maintained by BISSLabs. 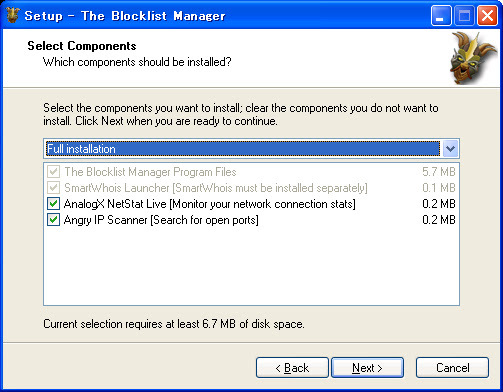 As per stated above, The Blocklist Manager 2.7.7 ships with an addon called the Angry IP Scanner which causing some FP's. Regarding to the above background, I would like to investigate the below challenge list by my poor blog writting, with the goal to improve Software maker knowhow in developing software with avoiding FP and AntiVirus products to prevent such False Positive occur in the future. This report will be useful to you if you came into analyzing a false positive case. 1. 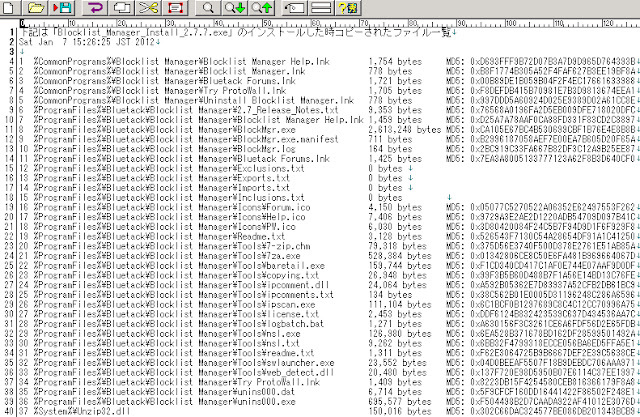 Is there really any malware attached in the software's installer file (Blocklist_Manager_Install_2.7.7.exe) ? If not, what caused the False Positive/FP of the installation file? 2. 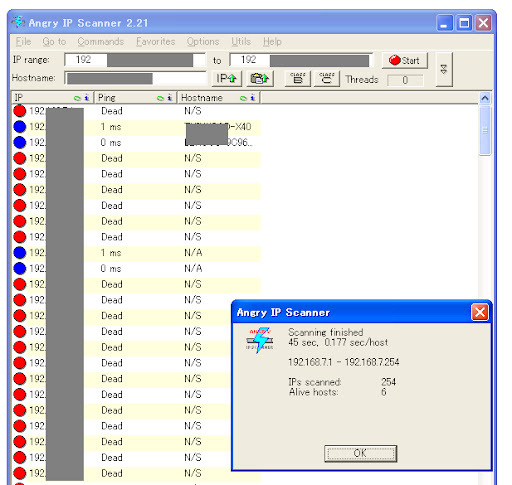 Why Angry IP Scanner addon causing many FP? How Angry IP Scanner got installed? 3. 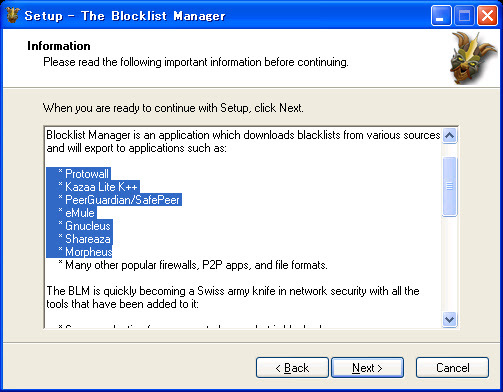 Can either Blocklist Manager 2.7.7 or Angry IP Scanner be categorized as malicious software/malware? Ex: Many Anti Debugging software/systems using the similar trace as per listed above, some are goodware packer based installer and some are security/hacking tools, the rest are malwares, cannot tell only by this trace info. 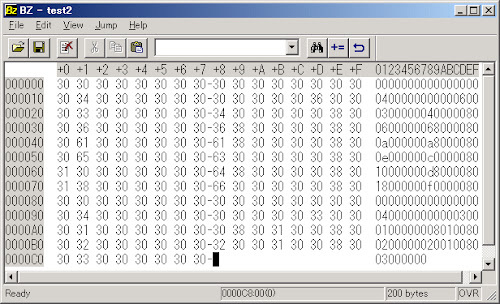 Ex: Call Traces details as per above often detected in malicious software due to its attempt to infect/exploit the victim, yet, often I saw some software installer tools are using the same method, specially the homebrew ones. There is a de facto in the developer to making the installer to avoid the above tracing calls. Ex: This is a definitely against the security policy for changing the DEP setting in the Windows setting by the user. However, few developer actually does it in order to make sure the installation will go as per expected. In my opinion the vendor should not go this far to make any installation works. Maybe (again, MAYBE) the vendor sees many FP for this installer, in order to override FP detected in the Windows Malware Protection or Anti Viral Software (whatever it is) he implemented this calls. 3.7.4. Privilege Escalation trace found! ProcessHandle [in] is a handle to the process whose access token is opened. The process must have the PROCESS_QUERY_INFORMATION access permission. DesiredAccess [in] specifies an access mask that specifies the requested types of access to the access token. These requested access types are compared with the discretionary access control list (DACL) of the token to determine which accesses are granted or denied. And TokenHandle [out] is pointer contains value to a handle that identifies the newly opened access token when the function returns. In the simple english: It means the installer is attempting to access other system's other process for some purpose. If the accessed process will be the other user's foreign process this will be a possible Privilage Escalation attempt. Many memory injection malwares are using this method in order to inject itself to a running process in the memory. So this is also causing a huge alert in some antivirus product while scanning this binary/installer. 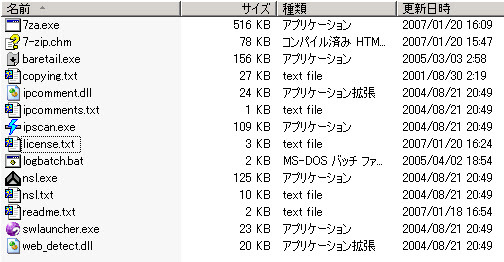 Ex: TlsGetValue is exported by kernel32.dll. Retrieves the value in the calling thread's thread local storage (TLS) slot for the specified TLS index. Each thread of a process has its own slot for each TLS index. I don't know why the maker is accessing this calls. Unfortunately this function often used by the FakeAV installer as per listed here. This will trigger the scan alert too. I did it more like 30 times with the random signatures, and all saying same stuffs.. No match. Which all of this says that I think no AV vendors is scanning the installer and judging with the simple binary pattern matching method only. The FP result must triggered by the suspicious code in installation binary. I am not going to judging anything here, the above binary analysis result cannot tell much unless we run and test the samle itself. I just want to see how the product is working, so I just run it in my RAT. And below is the screenshot as evidence and some pointers. 4.3. How the installation goes? How the Angry IP Scanner got installed? The installation goes smoothly well, so does the uninstall procedure. Below are the pics I took from my RAT during running and tests it, during the installation it was announced the additional tools to be installed, and among them the user is having the option to choose the tools to install too. Announcement of what will be installed.. you can see the full text here. 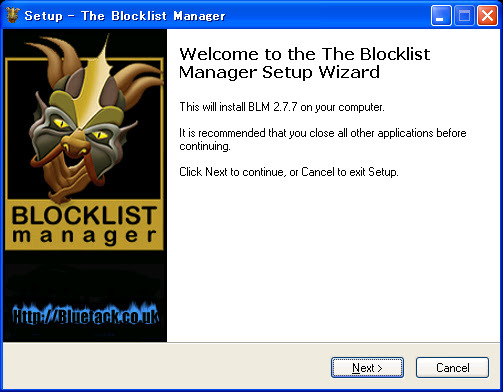 Select the component to install..
Blocklist Manager products upon execution..
And the system process shows like below during the scanning.. Above looks OK to me. I also run the checking on memory and ports over and over I did not see any malicious act of the software except the port scanning commands provided by this tool. No memory leaks, no nasty stuffs, no infection. 4.4. What's wrong behind the installation? 4.5.1. 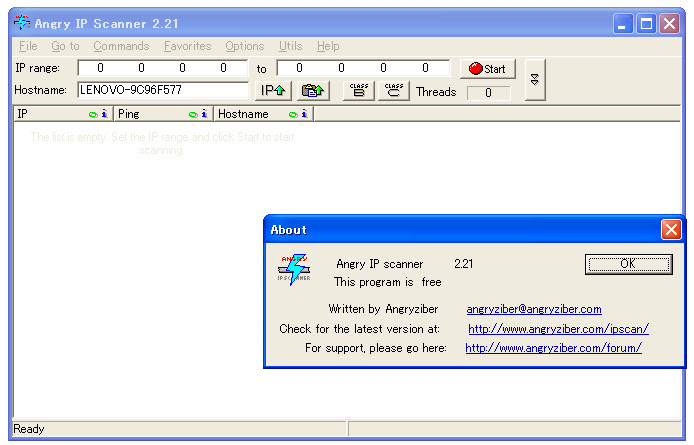 Many fake Angry IP Scanner (ipscan.exe) which actually a malware spreadwide in many free download sites. You may check it by Google search. Some security expert sites marked this software as malware like Threat Expert and Webroot Logo Prevx Research Division for some reasons. 5.1. 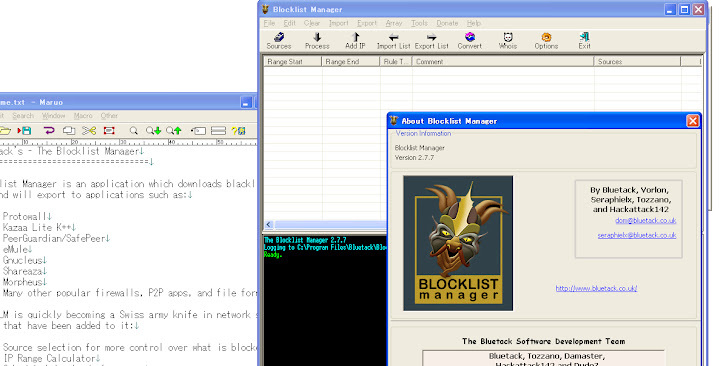 In my perception, after investigating the products based on the above analysis facts, I came into conclusion that Blocklist Manager 2.7.7 and its add-on tool Angry IP scanner (ipscan.exe) are not malicious software indeed. It is a package of a freeware handy security tools for Windows OS platform. As analogy...like a knife, a security tool can be a useful one or a dangerous one, it depends on the person who's using it, yet the tool itself is not malicious. 5.2. However by deeply look into the installation process and understanding it's components, we can learn how the False Postive result of some AV scanners came up, which actually can be avoided in the future development (hopefully). 5.3. I dedicated this report to my friend and also to the maker of Blocklist Manager 2.7.7 (which you are doing a good work for developing a such handy security tool), the AV vendors and all readers to understand the FP problem deeper. 5.4.Please do not depend on the automation scanning result since not every raised alarm/alert is caused by malware. Automation scanning's most demerit is the False Positive of a useful software like this case. In the above explanation at the Proof of concept bynary analysis parts is what the automation scanning result will be, actually while I tested it it is not a harmful software at all. I suggest that if you have the environment to test an unknown software, please do it so.